“Then he took the bread, said the blessing, broke it, and gave it to them, saying, ‘This is my body, which will be given for you; do this in memory of me.’ And likewise the cup after they had eaten, saying, ‘This cup is the new covenant in my blood, which will be shed for you'” (Lk 22:15-16, 19-20). Church teaching on the sacrament of the Eucharist is anchored in Scripture. Gospel accounts of the Last Supper are central to the church’s understanding of this sacrament. Other references from both the Old and New Testaments deepen that understanding. 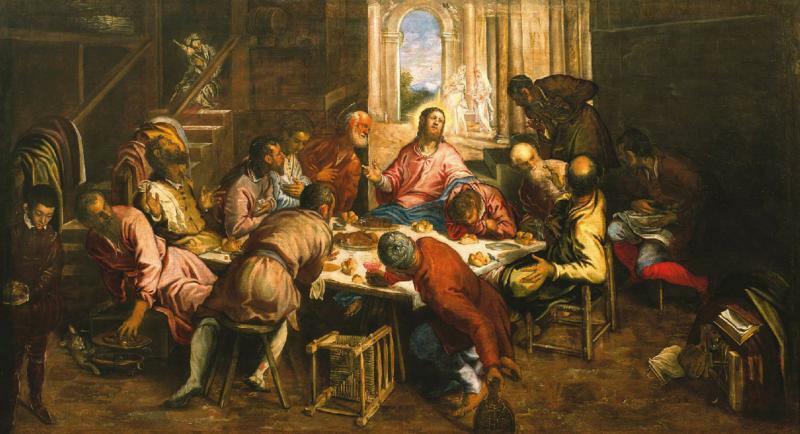 Instituted at a Passover meal on the eve of Jesus’ passion, the Eucharist connects the sacrifice of his body and blood “for the forgiveness of sins” (Mt 26:28) with God’s deliverance of the Israelite slaves from death through the sign of the blood of sacrificial lambs (Ex 12:3-13). Jesus, “the Lamb of God, who takes away the sin of the world” (Jn 1:29), established the New Covenant at that first Eucharist. The Catechism of the Catholic Church confirms that the sacrament “completes and surpasses all the sacrifices of the Old Covenant” (Heb 9:11-15; No. 1330). As God provided manna, bread from heaven, for the Israelites in the desert (Ex 16:4-5, 13-15), so Jesus revealed himself as the true, life-giving bread from heaven that promises eternal life (Jn 6:35, 51). “Whoever eats my flesh and drinks my blood has eternal life, and I will raise him on the last day. For my flesh is true food, and my blood is true drink. Whoever eats my flesh and drinks my blood remains in me and I in him” (Jn 6:54-56). Understanding that Jesus’ words were no mere metaphor, many abandoned him, scandalized by the idea of eating flesh or drinking blood. His disciples remained faithful, however, while taking Jesus at his word — as does the church today. The catechism states: “In the most blessed sacrament of the Eucharist ‘the body and blood, together with the soul and divinity, of our Lord Jesus Christ, and, therefore, the whole Christ is truly, really and substantially contained'” (No. 1374). And the church teaches that “by the consecration of the bread and wine there takes place a change of the whole substance of” both the bread and the wine into the substance of the body and the blood of Christ (No. 1376). This change is called transubstantiation. Also known as holy Communion, the Eucharist unites those who receive it with Christ himself — and with all those who share “one body and one Spirit … one Lord, one faith, one baptism” (Eph 4:4-5). Scripture-based church teaching affirms that the sacrament of the Eucharist is an opportunity for the faithful to be nourished by and united to the body of Christ.